How Much Does it Cost to Hire a Workers Comp Attorney? How Much Does it Cost to Hire a Work Comp Attorney? Many people get their ideas of attorneys from movies and TV. From high-tension courtroom scenes to last minute plot twists, a lot of the things people "know" about lawyers have very little to do with the reality of practicing law. One of the big myths we hear is that you have to be wealthy to hire an attorney. 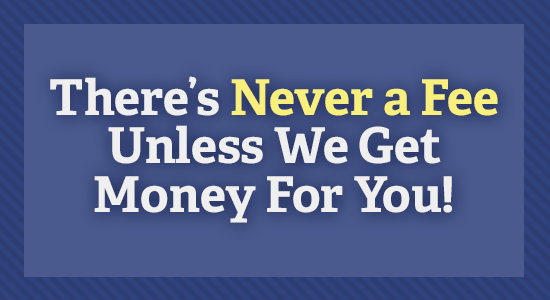 While some firms do bill clients an hourly rate or charge people upfront, we don't. We work on what's called a "contingency fee." That means that you don't pay us a thing unless and until we win your claim. Even our legal consultation is free, so if you have questions about your Pennsylvania work comp claim, get in touch with us. We can help if your claim was denied or if you need help filing one. Call us at 1-866-943-3427 or fill out the form to the right. Contingency fees allow you to choose your lawyer based on experience and track record instead of how much it costs. You can hire the best law firm to handle your claim and not worry that it will interfere with your ability to pay bills or take care of your family. Since you don't have to worry about how much it will cost to hire us, the only thing that's left to consider is what you stand to lose if you don't. Can you receive payments if your job requires travel — or lacks a fixed place of work — and you are injured in a car accident while driving? People who have no fixed place of work — like traveling nurses and consultants — are generally covered once they take to the road and are on the clock. For example, in most cases, a traveling salesperson would be eligible to receive payments if injured in a car accident while visiting clients. We can't tell you how many times we've heard clients say, "I thought I could handle it on my own." It's an understandable assumption, but people quickly learn that their employer's insurance company is just that – their employer's insurance company. Once you file your claim, you become the opposition, and it's their job to win. They have a number of tactics they can use to get the upper hand – from delaying your claim to offering you lowball lump sum settlements – and they bet on you not taking a stand against them. What's more, if you end up at a workers' compensation hearing without an attorney, it's likely that the judge will advise you to hire a lawyer before you proceed. That's because they've seen both sides of the system at work and understand that an experienced workers' compensation attorney will give you the best chance of getting the benefits you deserve. We've been handling Pennsylvania workers' compensation claims for decades. After helping over 8,000 injured workers, we know what it takes to get the job done. In addition to all of this, we give you peace of mind. We can't tell you the relief we've seen on clients' faces when they realize that they don't have to fight through the work comp system any more. If you hire us, you'll know that your claim is being handled by an entire team of professionals – from attorneys to support staff – who do this day in and day out. You can focus on yourself and your health and let us handle your workers' compensation claim.